Country: USA Wingspan: 36' 0"
Year: 1936 Length: 20' 0"
Horsepower: 40 Gross Weight: 1006 lbs. The Aeronca C-3s, nicknamed the "Flying bathtub", were manufactured from 1931 to 1937. With room for two adults the C-3 proved itself as being a low cost reliable airplane. This Aeronca C-3 was originally owned and flown by the Hughes Flying Service. 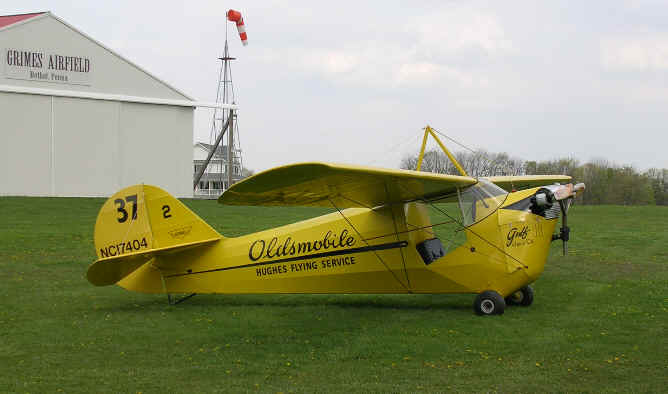 Sporting its sponsor’s name, Oldsmobile, Mr. Hughes would land on and take off from a specially equipped Oldsmobile sedan at air shows in the late 1930s. The restoration was completed by museum volunteers in 2005. Donated to the GAAM by the late Dr. James A. McCord.